Christie Leu Interiors design a modern wheelchair friendly house for a family of five. 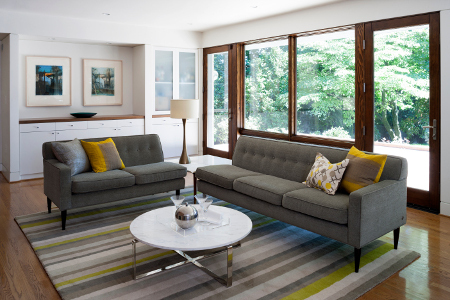 Christie Leu Interiors (https://www.christieleuinteriors.com) designed this accessible modern home for a family of five and worked with Washington, D.C.-based Hamilton Snowber Architects to focus on opening up the flow of an older home to fit modern life, while adhering to some very specific requirements. “The youngest child is an activist for physically handicapped children. He was born with spina bifida and energetically maneuvers everywhere in his wheelchair. At three-years-old this big personality went to DC to lobby for access to wheelchairs for young children like him. Stop in at any time and you will find this open house filled with children and friends,” says Leu. The family recognized that this house was perfect for their goal of an entirely wheelchair-friendly house. The layout was very horizontal and there was not a steep incline into the home. In addition, the home had main-floor bedrooms and a fairly flat lot. This was a typical 50’s house and hadn’t been updated since it was built, and not a “Mad Men” stylishly maintained version. It is still a modest size in a neighborhood where houses are being replaced by large, lot-maximizing dwellings. The kitchen was dated and felt tight. 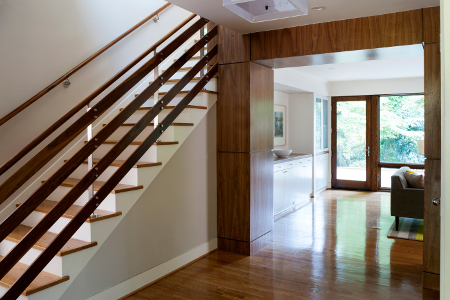 It had a large foyer and well-placed fireplace and stairwell which attracted the homeowners to the house. This allowed for an elevator without changing the floor plan too drastically or expensively. 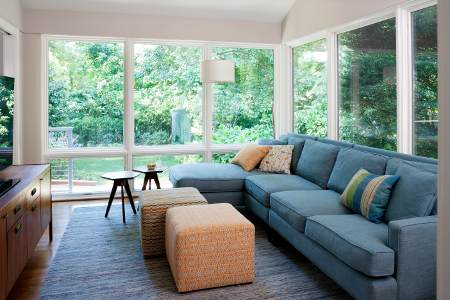 By maintaining the footprint, the team also kept a lovely backyard which acts like an extension to the living and sunroom with expansive floor-to-ceiling picture windows. 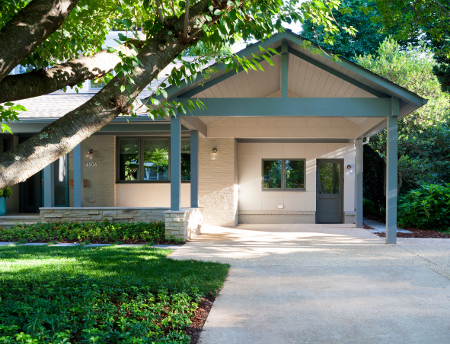 The inspiration for the project came from the good bones of this fifties home. Opening the wall between the kitchen and dining room created a great room feel. Without walls, it is easy for a wheelchair to move easily and adds to a wonderful flow within the house. The architects at Hamilton Snowber did everything so that every member of the family could use the whole house. 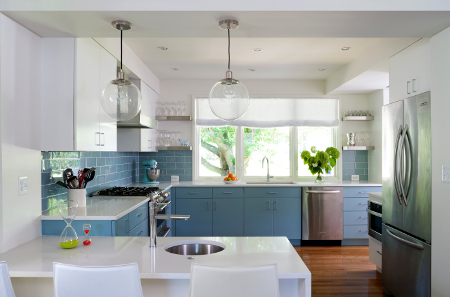 "Johnny can use the kitchen with a lower sink and workspace next to a standard height countertop for mom and dad. When his sisters invite him for a sleepover on the second floor, he will be there! He can roll into all three showers and can reach the basement via the walnut-paneled elevator to watch movies with friends or play shuffleboard," says Christie Leu. One of the biggest challenges of the design was considering how Johnny would need to move as he grew up within the home. 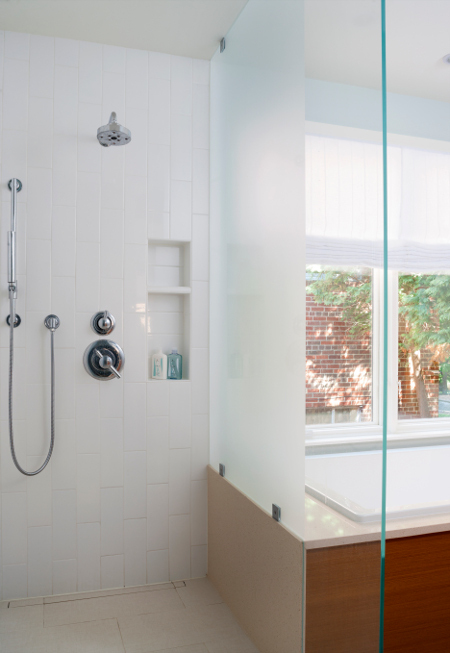 In designing for accessibility and keeping long-term growth in mind, Christie Leu and the architects made sure that all bathrooms and spaces, not just Johnny's personal bathroom, were designed for wheelchair accessibility. They wanted the child to feel like there was nowhere he couldn't go in his home. Instead of an island, Christie and the architects included a lowered, 30-in.-high peninsula with a sink; this way the youngest child can easily wash his hands and participate in cooking activities from his wheelchair. In addition, the house also allowed for a space to introduce an elevator for Johnny's wheelchair without having to drastically change the floor plan. This home is really a step forward in accessible beautiful design. Universality should be for everyone of all ages and should assist in creating a comfortable home for all. 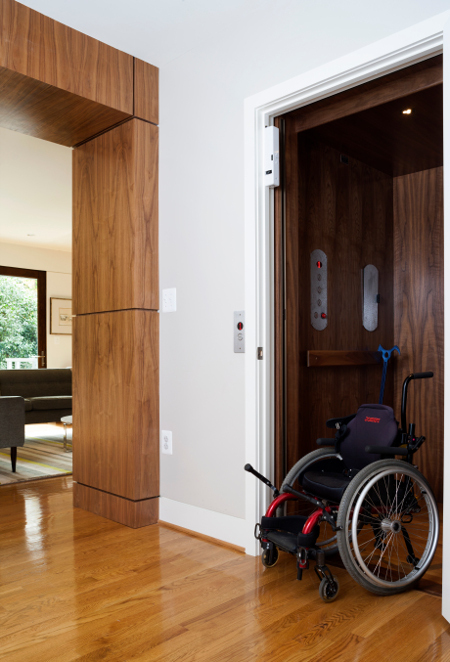 The variety of accessible design elements incorporated into this home is something that should be considered throughout many design projects, as every client has different needs and accommodations that need to be met. Beauty doesn't have to be compromised for function.